There are almost three million fracking wells or operations worldwide, and more than one million in the U.S. alone. 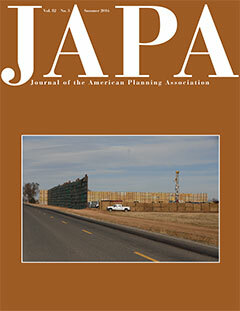 The cover article in the Journal of the American Planning Association's (JAPA) Summer issue focuses on how local communities deal with the dangers and problems created by local fracking. Fracking, or horizontal high-volume hydraulic fracturing, forces water and other materials under high pressure deep into the ground to extract petroleum and natural gas. Fracking accounts for almost half of all U.S. oil production and two-thirds of natural gas production, which has substantially reduced U.S. dependence on foreign sources of oil. In “Local Land Use Planning Responses to Hydraulic Fracking,” (82(3): 222-234), Carolyn G. Loh, associate professor in the Department of Urban Studies and Planning at Wayne State University, and Anna C. Osland, founder and principal of Anna C. Osland Consulting, evaluate the ways in which communities can and should respond to fracking. But there are heated debates about the long-term efficiency of these operations and whether fracking causes earthquakes or irreparable environmental damage. There is little doubt, however, that fracking can be a nightmare for the local communities that host such operations even as it brings new revenue into the area. Fracking creates congestion on roads not built to handle the volume or weight of new traffic, stresses existing infrastructure, causes short term housing shortages and affordability issues, and is associated with rapid increases in crime and traffic crashes. The visible equipment is also exceedingly ugly as the cover of the cover of the issue illustrates. And there is always the possibility of significant blowouts and spills. To add insult to injury, fracking operations often leave a community as quickly as they came, crashing the local economy that grew up to serve them. Many local communities are stretched to the limit in dealing with all these issues, but we have little research on how local communities regulate fracking activities. Loh and Osland investigated exactly what local planners can do to address all these problems. The authors surveyed 140 local government officials in four states with substantial fracking activity: Colorado, Louisiana, North Dakota, and Pennsylvania. They asked planners if and how they regulated fracking activities and focused on how well local government capacity (knowledge, experience, resources) influenced local fracking policies. The authors found that some states effectively prevent localities from restricting fracking activities, largely because they are so profitable for the state economy, even if the costs fall disproportionately on small cities. The authors found that less than half of their respondents had implemented any type of fracking regulations; only a handful had imposed moratoria on fracking. Loh and Osland also found, however, that communities with higher government capacity and those that had experienced fracking-related accidents were more likely to adopt stricter restrictions on local operations. Most importantly, the authors found that localities may underestimate their ability to regulate local fracking operations with existing planning regulations, such as fencing and landscaping requirements for fracking sites, restricting the location of industrial land uses including fracking, prohibiting the use of local roads by heavy vehicles involved in fracking operations, and requiring special land use permits for fracking sites and setbacks for compressor stations. The authors also found that one fourth of the communities surveyed had experienced a fracking accident of some kind in the previous five years, usually a discharge of hazardous liquids. They also concluded that the least advantaged communities are the least protected from potential fracking hazards. Ultimately Loh and Osland concluded that the more organizational capacity in local government, the more government can address an array of potential problems. The authors suggest that state governments should expand local technical and policy knowledge to let them better manage the local impacts of fracking. Sandi Rosenbloom is the editor of JAPA. She is a research professor at the University of Texas at Austin's School of Architecutre. Top image: Fracking operations. Photo by Flickr user WildEarth Guardians (CC BY-NC-ND 2.0).